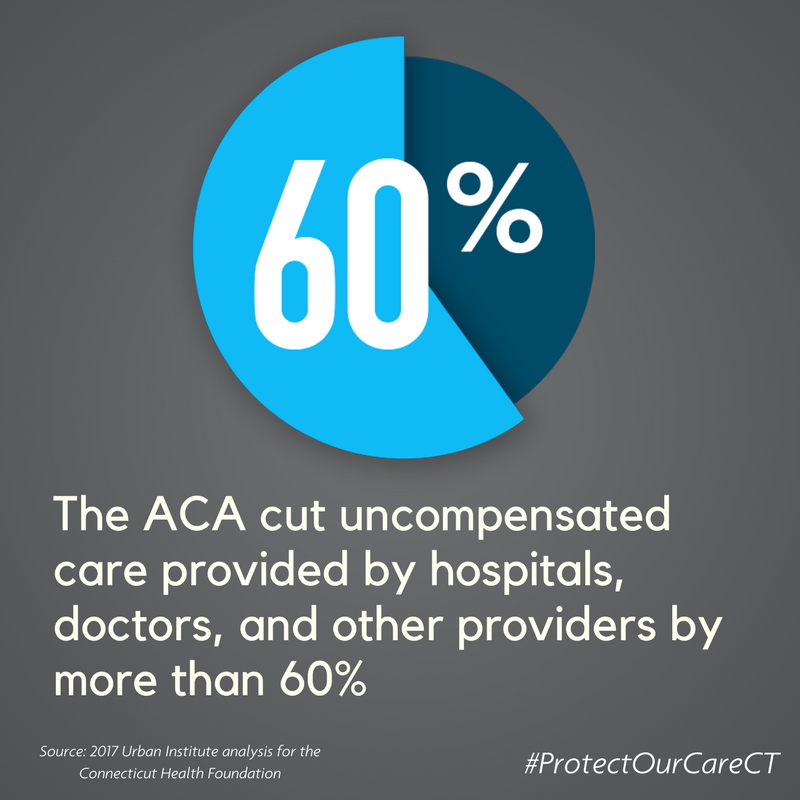 As lawmakers debate major changes to the federal health law, it is important to understand what’s at stake in Connecticut. 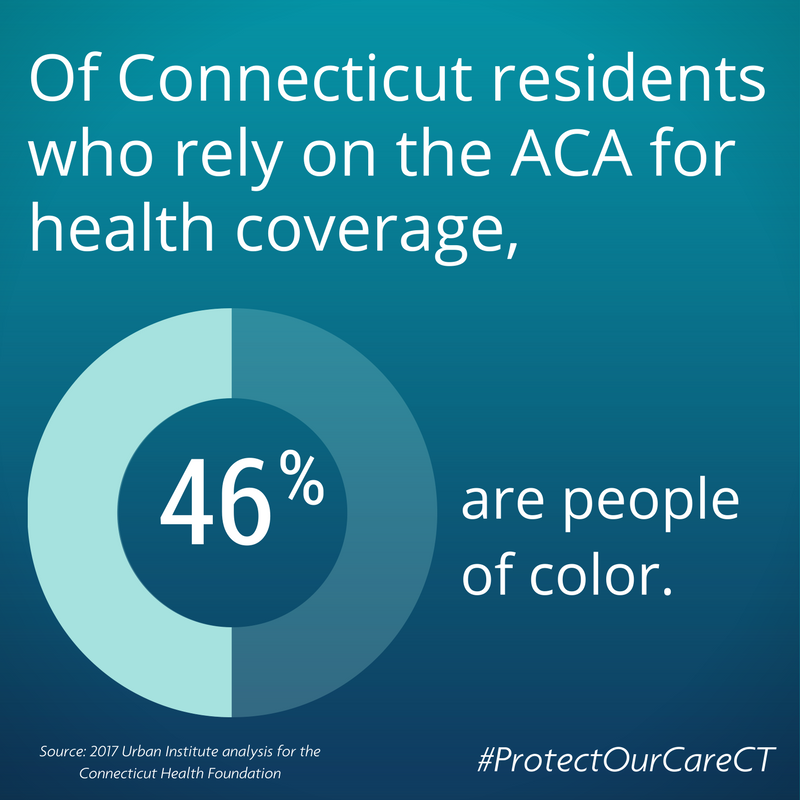 The Connecticut Health Foundation commissioned the Urban Institute to model the impact of the Affordable Care Act (ACA) on Connecticut, with a focus on state residents who might lack health care coverage without it. 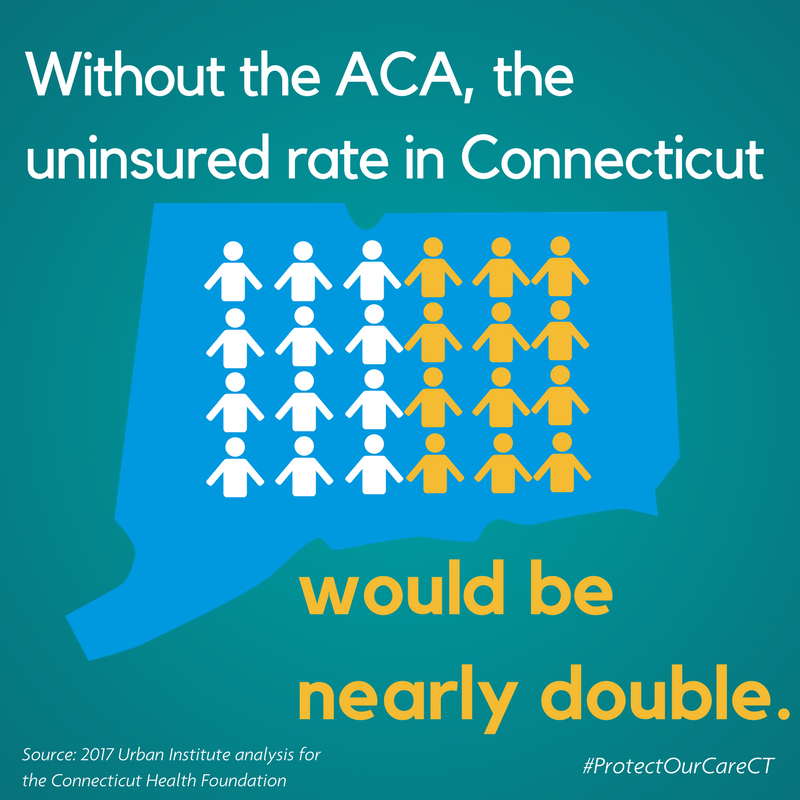 An estimated 198,000 Connecticut residents under 65 are uninsured this year, but without the health law, it would likely be 81% higher – 359,000. Put another way: For state residents under 65, the uninsured rate is 6.6%. Without the ACA, it would be 12%. Their insurance now covers preventive services with no out-of-pocket costs to patients. 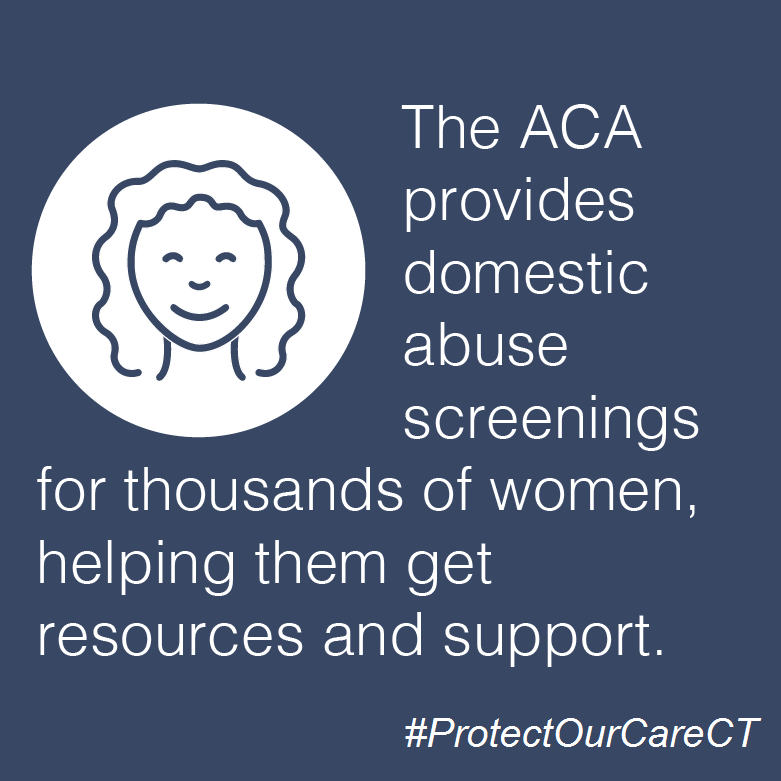 This includes check-ups for infants, children and adults; cancer screenings; and contraception. Insurance plans cannot impose annual or lifetime coverage limits for essential health benefits. Before the ACA, insurance plans commonly set dollar limits on how much they would cover, leaving people who faced high medical costs – such as for cancer treatment or after a car accident – with significant financial burdens, often leading to bankruptcy. 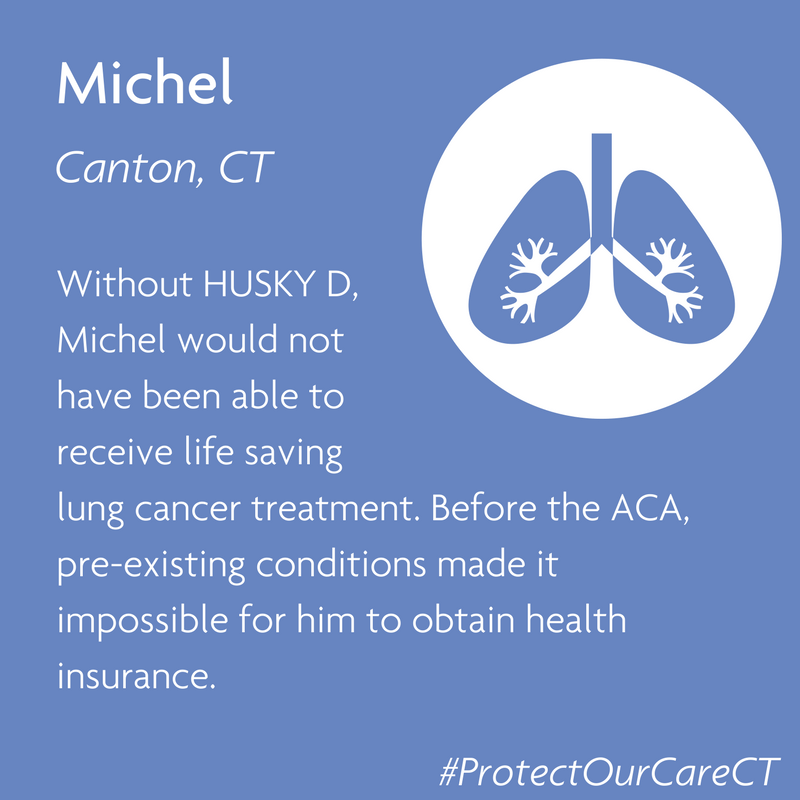 People cannot be denied coverage or charged more because they have a pre-existing condition. Before the ACA, many people with such conditions were unable to buy insurance. 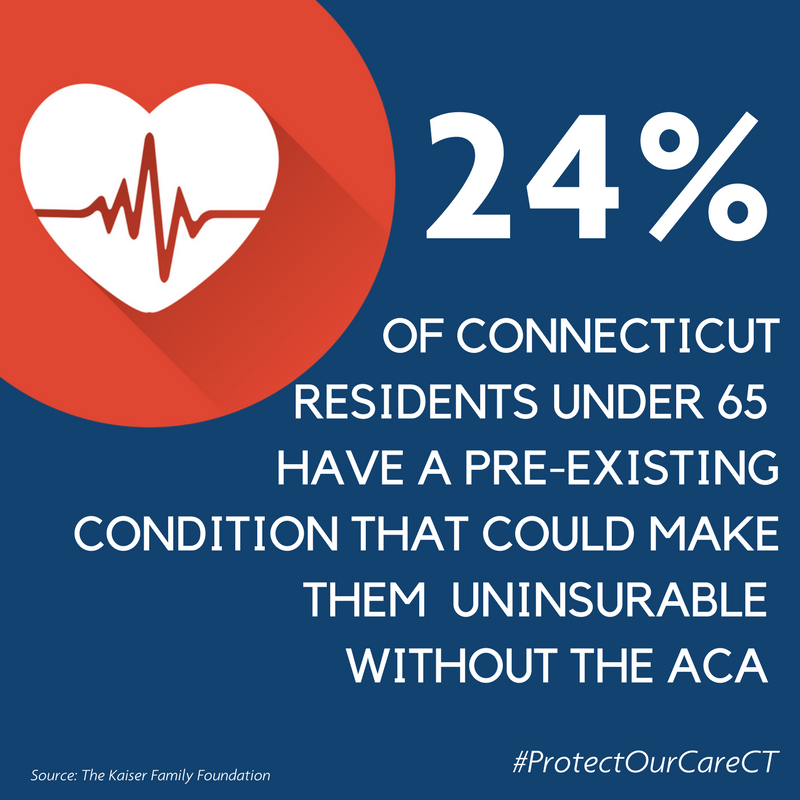 The Kaiser Family Foundation estimates that 522,000 Connecticut residents under 65 – 24% – have pre-existing conditions that could have left them unable to buy insurance before the ACA. 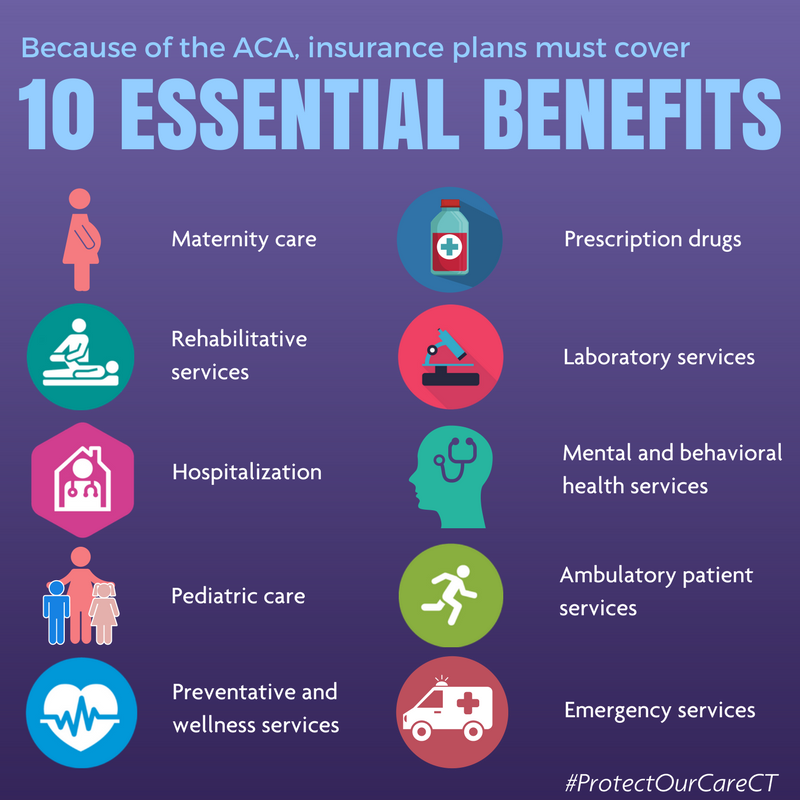 Insurance plans sold on the individual market must cover 10 essential health benefits, including maternity care and mental health and substance abuse treatment. These services were often not covered by plans sold through the individual market before the ACA. Approximately 73,000 people receive federal financial assistance to lower their monthly premiums. They now receive check-ups, cancer screenings, and other preventive services with no out-of-pocket costs. Those with annual prescription drug expenses between $3,700 and $4,950 – the “donut hole” – now receive Medicare payments to cover 60% of the cost of name-brand drugs and 49% of generics. Without the ACA, Medicare beneficiaries would receive no coverage for medication costs in this range. The Urban Institute’s projections indicate that in 2017, hospitals, physicians, and other health care providers would have delivered more than $1 billion in unreimbursed care to the uninsured without the ACA. Because of the coverage gains that occurred through the ACA, the amount of uncompensated care will be closer to $416 million – 61% less. In 2017, Connecticut is slated to receive $1.16 billion more in Medicaid funding and subsidies for private coverage from the federal government compared to what it would receive for Medicaid without the ACA. 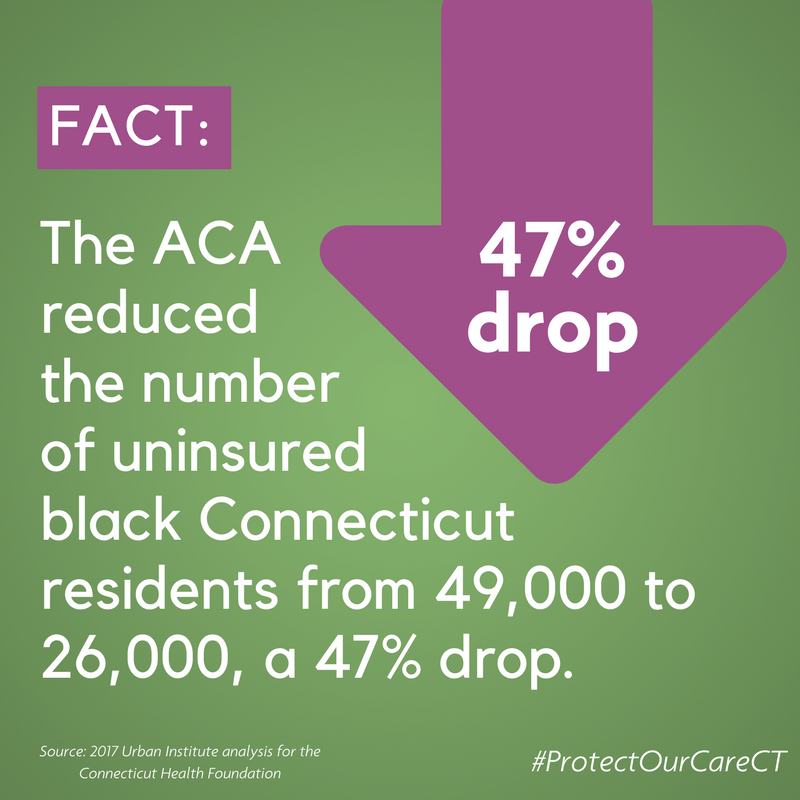 This additional funding has allowed Connecticut to spend $40 million less in state dollars on Medicaid than it would have without the ACA, while covering 138,000 more people through the program. 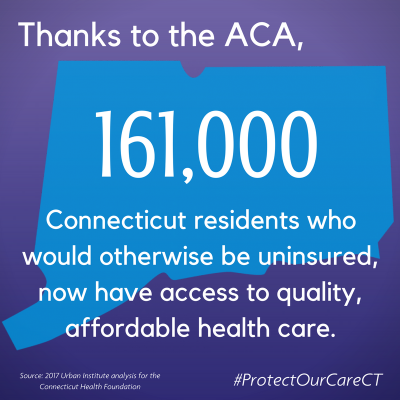 Nearly 100 Connecticut organizations – including hospitals, nursing homes, community health centers, and state government – are receiving more than $62 million in federal funds made available through the ACA to help develop new models of delivering care intended to improve outcomes and slow the growth of health care costs. The Urban Institute’s projections compare actual coverage and costs in 2017 under the ACA to estimates of coverage and costs in 2017 without the ACA. The estimates are based on the Urban Institute’s Health Insurance Policy Simulation Model, which is based primarily on data from the U.S. Census Bureau’s American Community Survey. 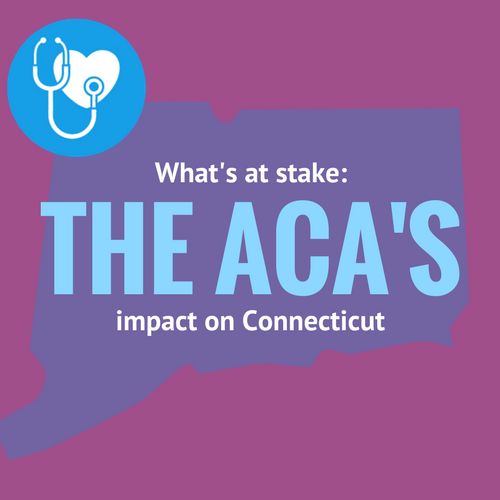 A full report with additional data on the ACA’s impact on Connecticut overall and on specific groups is forthcoming. 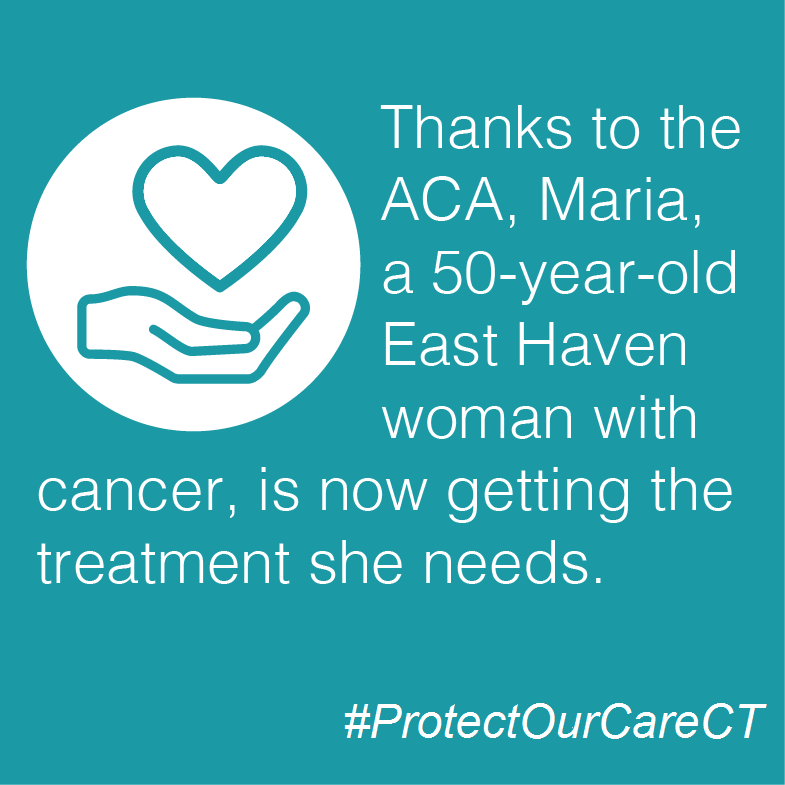 For more information, please contact Arielle Levin Becker at 860-724-1580 x 16 or arielle@cthealth.org. Click the retweet button under the image(s) of your choosing to share. Scroll to the bottom of the page to download the individual graphics.